The realisation of learning. | An alien voice under a duvet of dreams. Posted by phoenixaeon in Children's Literature, Conversations with Principessa, EA300, Films, OU, The Principessa Files. 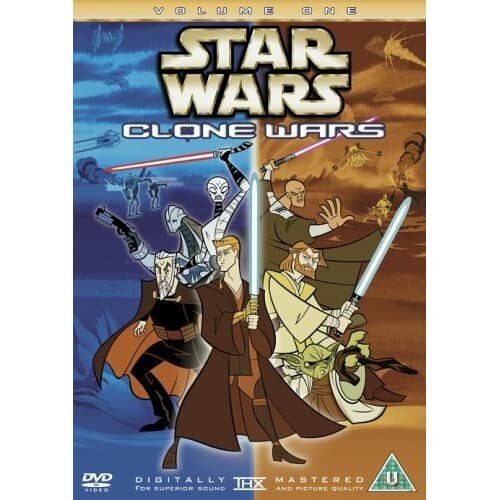 Last night, Princi and I sat down to watch Star Wars: The Clone Wars as her choice for the Friday night film. She’s been asking to watch it for weeks, but either she gets distracted or I get distracted. Either way, we’ve never managed to sit down and watch it. So when she got home from Tae Kwon Do last night, she set up the portable DVD player on my bed, settled herself down, and immersed herself into the world of Star Wars for the first time. Now, firstly, do I ever want to be a Jedi after watching that! I can’t understand how the Jedi were ever in any trouble after the way Windu air-swiped a whole legion of clones to dust with the Jedi mind-trick. (Yes, I know it’s a cartoon, but I have invested my time to geek out a bit!) Anyway, magical mystery Force and my want for that power aside, Princi loved it. As usual, she presented a running commentary (one bit in particular tickled me. Once the underwater, squid-headed blokie started making headway in his battle right at the start of the DVD, Princi turned round and said, ‘Yeah, now he’s starting to get somewhere!’), but halfway through, she showed me the DVD box. And yes, she was right. I’d not paid too much attention to the cover before, but now Princi had drawn focus to it. She wouldn’t be swayed from Anakin’s affiliation to the good side, despite the suggestions of the cover. She simply went on what she had seen and what she believed had been shown on the DVD, any implicit ideological suggestions on the box were ignored. All she cared about was that there were goodies and that they fought the baddies. But for me, I became aware of the change that had occurred in how I look at and interpret things since studying Children’s Literature. Before, it would not have occurred to me how the positioning of the character could inform me in such a way about the character’s belief system – okay, I know I have prior knowledge of the Star Wars universe, but still. I had to apply that knowledge to the image. Just that simple flick of an analytical switch by Princi had me smiling: what I had learned on EA300 had sunk in, and I am no applying it to situations that stimulate conversations between Princi and I. Above all else that I loved about the course, that is the most satisfying aspect. I really want to continue studying Children’s Literature now. It does feel as if it has become a passion, rather than just something I have studied on the way to getting a degree.